"Our atmosphere is very retro-kitsch, tongue in cheek holiday spirit, so Christmas sweaters, hats, lights, whatever you want,” said Drake. 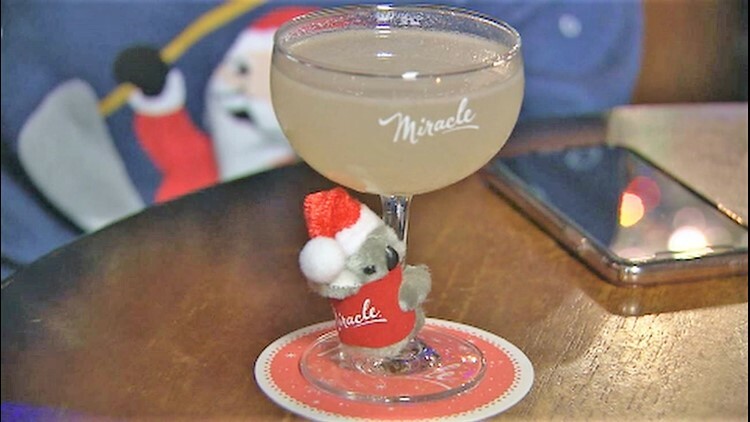 Some of the season specific drinks are the Run Run Rudolph, and the Koala-la la la, la la la la – made with gin and eucalyptus simple syrup and a cute stuffed animal. Gin and eucalyptus simple syrup.Plus a koala. Sunday the 16th: Nightshade Before Christmas - Dillingers is partnering with local farms to host a unique sit-down dinner featuring tapas style dishes all centered around the night shade theme. Tuesday the 18th: Charity Toy Drive sponsored by the Real McCoy Rum Distillery. Wednesday the 19th: Bittersweet - A special date night in conjunction with local Bittersweet chocolatier. Sunday the 23rd: Slay Belles Drag Show - Hosted by Dillinger’s own very own fabulous dishwasher turned super star Tess Tickles, Dillingers welcomes Olympia’s beloved drag troupe Legacy Oly for their Christmas drag spectacular! And to cap off the season Dillingers is hosting a New Year’s Eve coursed dinner featuring live local music and a few signature surprises. And Miracle will keep the all-holiday happy hour rolling until Dec. 31st. Good tidings for all. "It's just really fun to see how people get reminded of the holiday spirit,” said Drake.